This doughnut recipe is so good and fresh, you can't eat just one. There's no preservative after taste. It's just good old fashioned doughnut done right. Dissolve the yeast in warm milk, melted butter, and sugar for five minutes, then add all the remaining ingredients for the dough. Knead the dough until it's smooth and make a small ball the size of a baby fist. Place the dough balls in a large greased container with the cover on then let it rest in a warm place for about three hours or until it doubles in size (make sure not to let the doughs touch each other when they double in size). Place a half cup of milk, sugar powder, and cocoa powder in a pot and stir it until there is no more lump and cook over medium-low heat until the chocolate thickens. Then set aside. With a chopstick, poke the middle of the dough until you create a hole though to the bottom and continue with your two index finger to make a bigger hole. You're creating the doughnut here. Fry the doughnut until golden over medium heat. 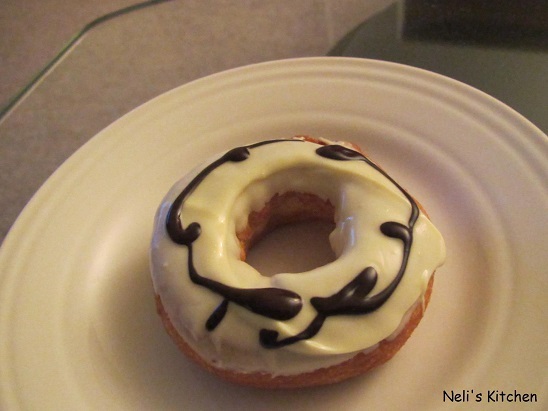 Dip the doughnut into the melted white chocolate and then finish off by drizzling dark chocolate on top like the picture above. Or you can dip the doughnut into the dark chocolate and top it with your favorite topping, such as almonds, nuts, etc. Enjoy your delicious homemade doughnut.